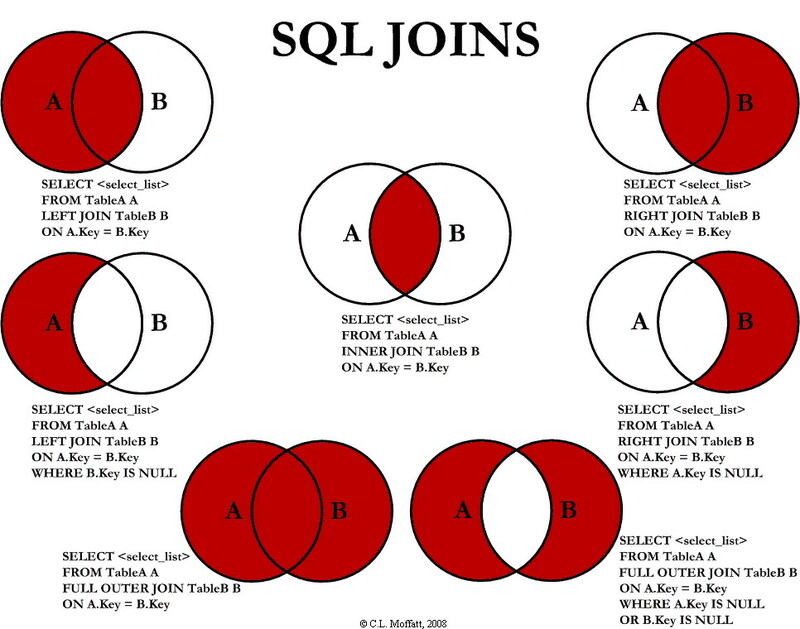 I've had trouble understanding joins in sql and came upon this image which I think might help me. The problem is that I don't fully understand it. For example, the join in the top right corner of the image, which colors the full B circle red and but only the overlap from A. The image makes it seem like circle B is the primary focus of the sql statement, but the sql statement itself, by starting with A (select from A, join B), conveys the opposite impression to me, namely that A would be the focus of the sql statement. Similarly, the image below that only includes data from the B circle, so why is A included at all in the join statement? The image makes it seem like circle B is the primary focus of the sql statement, but the sql statement itself, by starting with A (select from A, join B), conveys the opposite impression to me, namely that A would be the focus of the sql statement. Quite right. For this reason, RIGHT JOINs are relatively uncommon; although a query that uses a LEFT JOIN can nearly always be re-ordered to use a RIGHT JOIN instead (and vice versa), usually people will write their queries with LEFT JOIN and not with RIGHT JOIN. I agree with Cade about the limitations of Venn diagrams here. A more apposite visual representation might be this. The cross join (or cartesian product) produces a result with every combination of the rows from the two tables. Each table has 4 rows so this produces 16 rows in the result. The inner join logically returns all rows from the cross join that match the join condition. In this case five do. An inner join condition of 1=1 would evaluate to true for every row in the cross join so the two are equivalent (SQL Fiddle). Venn diagrams are suitable for representing set operations such as UNION, INTERSECTS, EXCEPT etc. To the extent only that those set operations like EXCEPT are simulated with things like LEFT JOIN WHERE rhs.KEY is NULL, this diagram is accurate. Otherwise it is misleading. For instance, any join can cause rows to multiply if the join criteria are not 1:1. But sets are only allowed to contain distinct members, so those cannot be represented as set operations. Sticking to joins on keys may be fine for the first few minutes of a tutorial, but this can lead to a poor path for learning what joins are about. I think this is what you have found. This idea that Venn Diagrams can represent JOINs generally this way needs to go away. When you do a join, it is likely that your two tables might not match up perfectly. Specifically, there could be some rows in A that don't match up to anything in B, or duplicate rows in A that match up with a single row in B, and vice-versa. Center left and right are technically joins, but pointless ones; they could probably be more efficiently written SELECT <select_list> FROM TableA A WHERE A.Key NOT IN (SELECT B.Key FROM TableB B) (or the opposite). In direct answer to your confusion, RIGHT JOIN says "the following expression is the focus of this query". Lower right is rather strange, and I see no reason why you would want that. It returns the results from the two outer middle queries, mixed together with NULL's in all of the columns for the opposite table. For the right join, yes the syntax can be confusing, but yes it is what it seems to be. When you say "TableA RIGHT JOIN TableB", it is indeed saying that TableB is the main table that you are referring to and TableA is just hanging on where it has matching records. This does read weird in queries, because TableA is listed first so your brain automatically assigns more priority to it, even though TableB is really the more important table in the query. For this reason, you rarely actually see right joins in real code. So instead of A and B, lets take two things that are easy to keep track of. Supposed we have two tables for people's info, ShoeSize and IQ. You have ShoeSize info for some people, some IQ info for some people. And have a PersonID on both tables that you can join on. ShoeSize RIGHT JOIN IQ -> give me all of the IQ information. Include any ShoeSize information for those people if we have it. ShoeSize FULL OUTER JOIN IQ -> Give me everything, all shoe sizes and all IQ data. If any ShoeSizes and IQ records have the same PersonID, include them in one row. ShoeSize LEFT JOIN IQ -> Give me all of the shoe size info. Include any IQ information for those people if we have it. Not the answer you're looking for? Browse other questions tagged sql mysqli visualization set-theory or ask your own question. How to simulate ifs in a sql query that is not database server dependent?